The ISGS website has been created to enhance your passion for genealogy. It not only features links to ISGS projects, but also links you to other records and resources throughout Illinois including those individual genealogical home pages that have an Illinois connection! The current issue of the ISGS Newsletter and archived copies back to 2008. If you are not an ISGS member but would like to receive the ISGS Newsletter in your email inbox, click this link – http://eepurl.com/iil3Y to sign-up on our email list. ISGS Members are encouraged to sign-in at the Members Only Section to access special members-only databases and resources. Join us on Tuesday, May 14, at 8:00 PM Central, for an introductory lecture on researching your Mexican ancestors. Our presenter, Colleen Greene, MLIS, is a librarian, genealogist, historian, and educator. She holds a BA in History, a Masters of Library & Information Science, and a certificate in genealogical research from Boston University. This introductory lecture covers key U.S. records and strategies for identifying when and where your Mexican ancestors immigrated, and for identifying their hometown in Mexico. It will also provide an overview of the main Mexican record types available online. Spread the Word: Forward our Webinar Flyer to your friends and colleagues, post the information to social media sites and/or your blog/website, or print out a few copies to hand out at your local society meetings. To download the Flyer, click here. Make a Contribution: Support the ISGS Webinar program by making a financial contribution, which will help ISGS expand its educational offerings in a virtual manner. To learn why we need your help, or to make a contribution, please visit our Webinar Fund Donation Page. Our 2019 Webinar Schedule is now available! Click HERE for details and Registration Links! The 2019 ISGS Webinar Series is Sponsored by FamilySearch. March/April 2019 ISGS Newsletter Now Available! Our March/April newsletter is now available! Click on the newsletter above to view or download. To view and download issues of the ISGS Newsletter from 2019 thru 2008, click HERE. 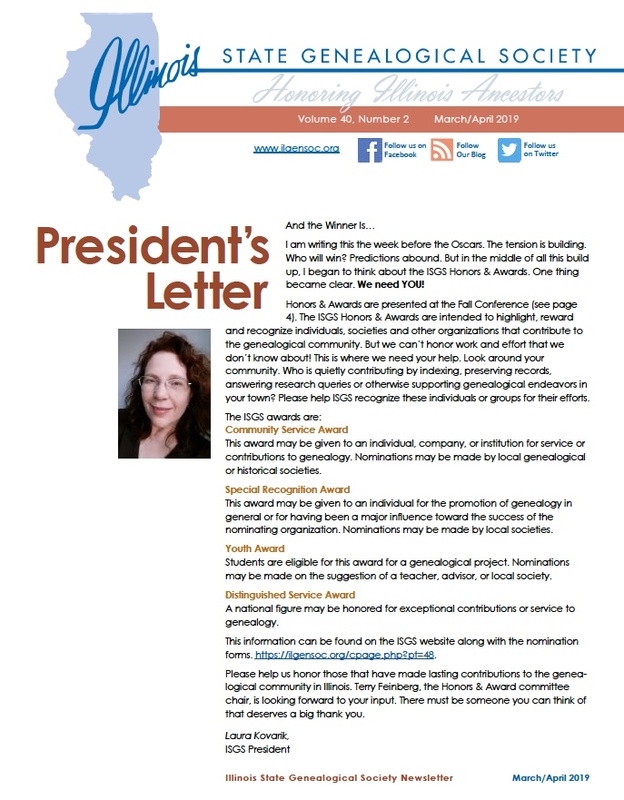 If you are not an ISGS member but would like to receive the ISGS Newsletter in your email inbox, click this link – http://eepurl.com/iil3Y to sign-up on our email list.